It is the best way to meet players the same level as you. Why play in an affiliated club? A club is deemed “affiliated” when it holds ACBL-sanctioned bridge sessions. Only these matches award masterpoints and allow players to gather pigmented points. Through compilation of these points, players are classified into different categories: Beginner, Intermediate and Advanced. Bridge players of all skill levels play in affiliated clubs. These clubs are not restricted to experienced players. How do I join the Montreal Bridge League? If you are a member of the American Contract Bridge League (ACBL), you are automatically a member of the Montreal Bridge League. The ACBL is an organization whose mission is to promote, grow and sustain the game of bridge and to serve the bridge-related interests of its members. It brings together players from the United States, Canada, and Mexico, i.e. 25 districts, each divided into units to make it easier to effectively reach all its members. The Montreal Bridge League, identified as unit 151, is part of District 1, which covers Eastern Canada. What are the ACBL and the CBF? AMERICAN CONTRACT BRIDGE LEAGUE (ACBL): The ACBL is the organization whose mission is to promote, grow and sustain the game of bridge and to serve the bridge-related interests of its members. It manages and regulates tournaments held in its jurisdiction, which covers the United States, Canada, and Mexico. CANADIAN BRIDGE FEDERATION (CBF): The mission of the CBF is to promote bridge within Canada and to protect and advance the interests of Canadian bridge. This includes the selection and support of Canadian bridge teams and players which represent Canada in international competitions. What is « duplicate bridge »? In a duplicate bridge session, two players form a team, and all teams play the same hands one after the other. Two teams meet at one table and play a given number of boards, generally three. After each board, the cards are placed back into their bridge board, each hand being placed in the position identified to each player. Once all these boards are played, the East-West teams move to the next higher table, and the boards go to the next lower table. The North-South teams remain stationary throughout the session. Since the tables are numbered, it makes it easier to follow the movement. For example, the East-West pair on Table 2 goes to Table 3 while the Table 2 boards go onto Table 1 to be played by other teams. The same is repeated at the other tables, and this goes on for the entire session, usually made up of 8 or 9 rounds of 3 boards each (or 12 or 13 rounds of 2 boards). Duplicate bridge is not based on luck because teams’ scores are compared to that of other teams playing the same hands at different tables. Compiling the results determines which teams performed best. Duplicate bridge involves implementing genuine strategies and making the best decisions at the right moment. Scores are compared and matchpoints are calculated: the team which gets the best result for a given board receives the largest number of matchpoints for that board. What are « Swiss Teams »? “Swiss Teams” are a type of team play. The teams are made up of 4 to 6 players, 4 of which are playing at the same time: one pair from team A plays N-S at one table while their partners play E-W at another table. Two pairs from the opposing team fill the empty spots at the two tables. Usually, 6 or 7 boards, shuffled at the beginning, are played in each round. After these boards are finished, each team compares the results from each board played. The scores are compared in “IMPs” using a scale which attributes a number of IMPs according to the point difference. You will find the scale on the convention cards. The number of rounds varies according to how the competition is organized. The game has many variants for teams of 4: Stratified Teams, Stratiflighted Teams, Bracketed Teams, Bracketed Knockout, and Compact Knockout. How do stratified games work? Stratified games bring together in the same “strat” or “stratum” the players of the same caliber. Up to 3 different categories with 3 different rankings can be created in a match in which players of all levels play together. To do so, the room is split into 3 sections of similar strength. Pairs from the lowest stratum, usually strat C, can place in all strata. Players from the 2nd stratum (B) can place in the top two highest strata, but they cannot appear in the lowest strat’s ranking. Finally, the pairs in the top stratum can only appear in that stratum’s ranking. Can I receive credit for the masterpoints that I won before joining the ACBL? You can receive credit for up to 20 masterpoints won in the 12 months preceding the moment you joined ACBL. The easiest is to register through the club in which you usually play. The director will gladly add your membership number to his or her database and give you credit for the masterpoints that you have been awarded. As soon as you receive your membership number – be it after registering with a club, directly through the ACBL or during a tournament – you can ask the directors at the clubs in which you have earned masterpoints to ensure that they are credited to your account. How can I earn black, silver, red, gold or platinum points? BLACK: masterpoints won in regular bridge sessions in an affiliated club. SILVER: masterpoints won in events at sectional tournaments or at Sectional Tournaments at Clubs (STaCs). Sectional tournaments: The Montreal Bridge League organizes 3 sectional tournaments each year: during the spring, in the fall and in the winter. You will be awarded Silver masterpoints if you get a placing in one session. RED / GOLD: masterpoints won in regional and national tournaments that last a minimum of 6 days. Each year, the Montreal Bridge League holds the “Can-Am,” its regional tournament, during the month of August. To win gold masterpoints during this type of tournament, you must play at least 2 sessions in the same event and earn an overall placing. Otherwise, the masterpoints are red. PLATINUM: Only national-rated events held during a national tournament (NABC) award platinum points. National tournaments are sanctioned by the ABCL, which organizes 3 each year. They are held in different cities. All tournaments are not equal. Their organizers and duration vary, and they award different types of masterpoints. I don't have a partner. What can I do? Most bridge clubs offer excellent pairing services. Get in touch with them to learn how they work. A great number of bridge players meet their partners thanks to club pairing services. A majority of new players meet their partners during a beginner bridge class. Therefore, do not hesitate to sign up, even on your own: you will meet lovely people and have the opportunity to play with different partners during the practice sessions. You can also use a partner search module, free of use on the Find a Partner section. All tournaments offer pairing services. The name and contact details of the person responsible for pairing can be found on the flyer distributed to bridge clubs and posted on the website. 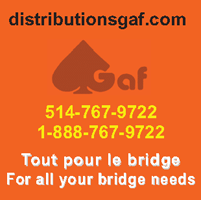 For tournaments organized by the Montreal Bridge League, please consult the Find a Partner section. When can I call the director to my table? Must I call him or her? The director must be called to the table as soon as an irregularity is noticed. You can therefore call the director to your table at any moment, be it before, during or after the play. All players, including the dummy, can call the director. However, the dummy cannot bring attention to a possible infraction before the end of the play. There are also time limits to bring attention to an infraction. Certain infractions cannot be penalized if you have started the next board, or the next round. How to tell what can be alerted and what cannot? The ACBL publishes the official Alert Chart on its website acbl.org . The ACBL General Convention Chart applies to all ACBL-sanctioned matches, therefore in all matches played in clubs and in the majority of tournaments. In top-level tournaments, the Mid-Chart is accepted in team competitions so long as there is a minimum amount of masterpoints in said category. How do Percentages, Matchpoints and IMPs work? Matchpoints and IMPs are two different scoring systems. Matchpoints refer to a scoring system for pairs competitions: they are calculated by comparing your score to that of other pairs. Your final result, indicated in the form of a percentage, comes from your cumulated matchpoints calculated for each board in the session: 1 point for each pair whose score you beat, and ½ point for each pair whose score you tie. If all pairs have earned the same score for every board, each will get a 50% result. Remember that you will get a zero if your contract is defeated while others make it, but you will earn a “super-top score” if you win one more trick than the other pairs. International Match Points (IMPs) refer to a scoring system for team competitions: they are calculated by comparing your score to a datum (comparative score). At the end of each round, the two teams compare their score with their teammates for each board played, and identify their IMPs using a chart indicated on the convention card.